As was the case with Marshmallow, some of the most exciting aspects of Android N aren't things you can see, but changes that are taking place in the background. When the next version comes to your phone, you're going to see a performance boost. To understand why, close your eyes. Okay, now open them back up so that you can continue reading. Crap, I've already lost you. Alright, you've made it this far. That means you've opened your eyes. Thanks for that. Now, picture the lag that happens whenever you take a picture or toggle Wi-Fi on after it's been off a while. The stutter may be brief. If you have a newer phone and don't have many apps installed, you may not notice it at all. If your device is older and cheaper, you may experience slowdown that almost makes you want to undo what you just did. That's because a bunch of apps are monitoring your device for the arrival of new pictures and video or changes to network connectivity. Dropbox, for example, wants to know when you snap a photo so that it can back up the image. If you take a bunch while offline, it wants to know when you're connected again. When a fourth of the apps on your phone are keeping an eye out for these changes, you may experience a reduction in performance. And there's no pill you can take for it. With Android N, apps will have to wait their turn. 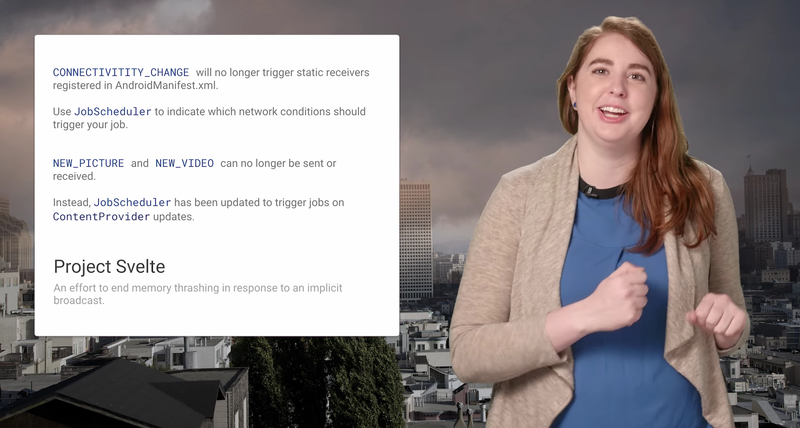 Rather than taking an action at every CONNECTIVITY_ACTION, ACTION_NEW_PICTURE, or ACTION_NEW_VIDEO broadcast, apps will wait for the JobScheduler API to tell them when it's time to act. @martimlobao Uploads will happen, but on WiFi and in batches. So from a user POV, camera apps and their device will be faster. Actions will take place on a predetermined schedule. You can increase or decrease how often apps wake up by adjusting Data Saver settings. This change encourages apps to use Wi-Fi rather than cellular data, and tasks will occur in batches rather than at the time of each individual action. In the end, you're saving data and getting better performance at the same time. You might even eke out extra battery life due to reduced network usage. On a mobile device, all of this sounds like win.